Uttarakhand Public Service Commission ( UKPSC ) has declared the Combined State Lower Subordinate Service Pre Exam 2016-17 Result Cut off Marks and Revised Answer Key. The UKPSC lower subordinate Service exam was held on 20 November 2016 for various posts Naib Tehsildar NT ,Supply Inspector (Purti Nirikshak) (Food and Civil Supplies Department) Taxation Officer (karadhikari) (Panchayat Raj Department) ,Passengers Tax Superintendent (Yatri Kar Adhikshak). 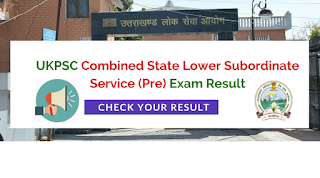 Candidates who have appeared in Uttarakhand UKPSC Lower Subordinate Exam (Pre)-2016 can check their results cutoff marks on UKPSC official website http://www.ukpsc.gov.in or direct link given below.